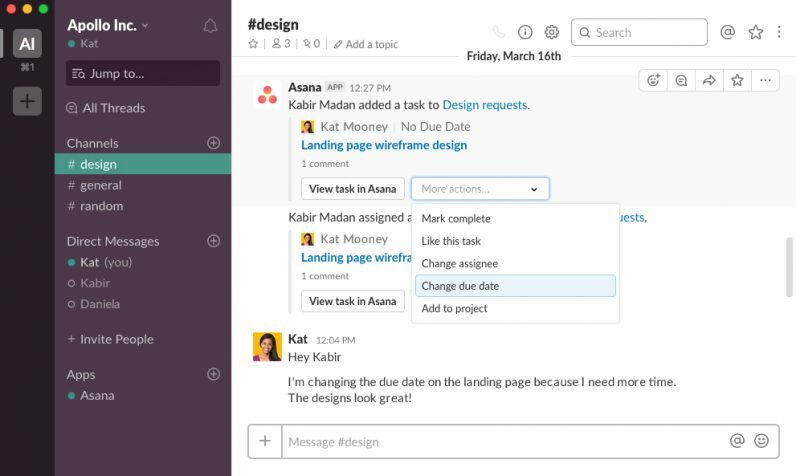 Productivity giant Asana has launched a new Slack plugin, which promises to transform off-the-cuff ideas into actionable tasks you can put on your to-do list. The new plugin takes advantage of some of the new features in Slack’s API, and allows users to perform tasks in Asana without having to leave the popular chat service. With the plugin installed, users can create a task simply by hovering over a message, clicking the More Options icon, and selecting “Create a task.” Here’s how that looks like in practice. As you can tell from the above GIF, when you create a task, the plugin duplicates text from the message. It also includes a link to it, if users want to see the context in which it was said. Users can also mark tasks as complete, change due-dates and asignees, and view updates on projects, all within Slack. According to Alex Hood, head of product at Asana, roughly half of the company’s customers also rely on Slack for day-to-day workplace communication. “More than half of Asana customers use Slack, so these two solutions need to work together effortlessly,” he said. You can find the new Asana plugin on the company’s website, or through the Slack apps directory.